Dinah Mulock Craik’s Victorian fairytale The Little Lame Prince and His Travelling Cloak (1874) tells the story of Prince Dolor, whose legs are disabled after a nurse drops him at his christening. Following the death of his father, the king of Nomansland, the infant Prince Dolor is secretly banished to a distant tower by his wicked uncle. 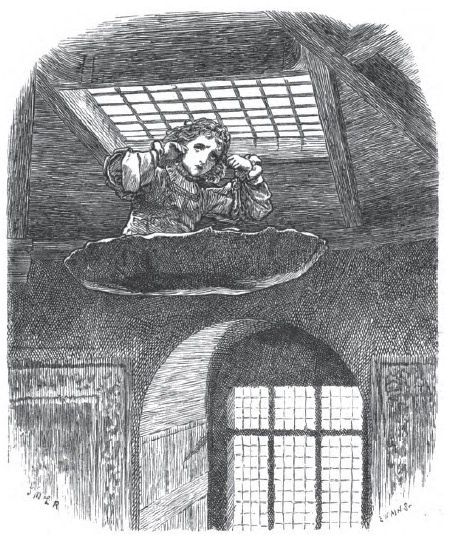 Dolor grows up in the tower, unaware of his position as the true king of Nomansland and, as the excerpt below suggests, equally unaware of his identity as a person with disability until his fairy godmother, Stuff-and-nonsense, provides him with a magical travelling cloak that allows him to leave the castle. The adventures Dolor has on the cloak teach him lessons that make him a better ruler when he is eventually reinstated as Nomansland’s king. In the excerpt below, Stuff-and-nonsense gives Dolor his magical travelling cloak, explaining that she does so because he cannot walk. Craik wrote prolifically about the lives of people with disabilities, and explored in her fiction the consequences of being deemed physically different in a world that privileges “normalcy.” Significantly, Craik’s portrayal of disability reveals that the Victorian perception of disability was complex and, at times, self-contradictory. The following excerpt paints disability as immutably and pitiably “different,” producing for the fairytale’s audience a sentimental lesson on accepting one’s circumstances; however, at the same time, the scene demonstrates that the primary problems of disability are social, not physical. What makes Dolor weep is his social isolation, not his physical difference. The old woman laughed—long and loud, though very sweetly. “Am I?” said the Prince, and looked first with curiosity, then with a sort of anxiety, into his godmother’s face, which was sad and grave, with slow tears beginning to steal down. “I am not afraid,” said the boy; but he turned very pale, and his lips began to quiver, though he did not actually cry—he was too old for that, and, perhaps, too proud. Though not wholly comprehending, he began dimly to guess what his godmother meant. He had never seen any real live boys, but he had seen pictures of them; running and jumping; which he had admired and tried hard to imitate, but always failed. Now he began to understand why he failed, and that he always should fail— that, in fact, he was not like other little boys; and it was of no use his wishing to do as they did, and play as they played, even if he had had them to play with. His was a separate life, in which he must find out new work and new pleasures for himself. The sense of the inevitable, as grown‐up people call it—that we cannot have things as we want them to be, but as they are, and that we must learn to bear them and make the best of them—this lesson, which everybody has to learn soon or late—came, alas! sadly soon, to the poor boy. He fought against it for a while, and then, quite overcome, turned and sobbed bitterly in his godmother’s arms. “No, I don’t think I do mind—that is, I won’t mind,” replied he, catching the courage of her tone and speaking like a man, though he was still such a mere boy. Dinah Mulock Craik, The Little Lame Prince and His Travelling Cloak: A Parable for Young and Old. Illus. John McL. Ralston. London: Daldy, Ibitser & Co., 1875. Pages 59-61. Available online at the Indiana Women Writer's Project. Dowker, Ann. “The Treatment of Disability in 19th and Early 20th Century Children's Literature,” Disability Studies Quarterly 24.1 (2004). Available online. Hingston, Kylee-Anne. "Prostheses and Narrative Perspective in Dinah Mulock Craik's The Little Lame Prince." Women's Writing. Forthcoming in 2013. Holmes, Martha Stoddard. Fictions of Affliction: Physical Disability in Victorian Culture, The Corporealities Series (Ann Arbour: U of Michigan P, 2004) 48. Mitchell, Sally. Dinah Mulock Craik. Boston: Twayne Publishers, 1983. Available online on the Victorian Web. Craik, Dinah Mulock, “The Little Lame Prince,” Nineteenth-Century Disability: Cultures & Contexts, accessed April 23, 2019, http://nineteenthcenturydisability.org/items/show/14.